People watch a banner showing North Korean leader Kim Jong Un, left, and South Korea President Moon Jae-in to wish for the successful inter-Korean summit, at Seoul City Hall in Seoul, South Korea, Wednesday, Sept. 12, 2018. Can North Korea, South Korea, and the United States successfully negotiate peace on the Korean Peninsula? And if so, how? On the verge of the third, and longest, inter-Korean summit in less than five months and with Pyongyang and Washington now discussing a potential second summit, the possibility of peace seems closer than ever before. Yet, there is need for caution. 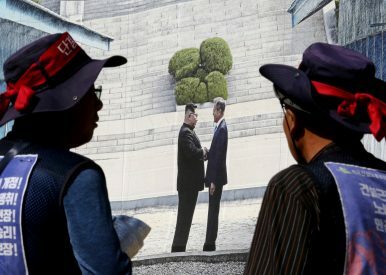 A peace treaty putting a formal end to the Korean War is as likely as a return to the hostility that defined North Korea-U.S. relations throughout 2017, as we argue in a new report jointly published by the London Asia Pacific Centre for Social Science, the Henry Jackson Society, and the KF-VUB Korea Chair. North Korea is the key actor to solve the Korean Peninsula conundrum. Pyongyang’s authoritarian regime and development of nuclear and missile programs are the main impediment to a peaceful Korean Peninsula. The main reason behind these programs is survival. For decades now, North Korea has seen a nuclear deterrent as the only real guarantee against regime change. The fates of Saddam Hussein in Iraq and, especially, Muammar Gaddafi in Libya were particularly instructive. From Pyongyang’s view, both leaders were removed from power and ultimately killed by their own people because they lacked a nuclear deterrent and other weapons of mass destruction. But there is another potential path toward regime survival. A prosperous, economically vibrant North Korea recognized as an equal partner by the international community would also guarantee Kim Jong Un’s power. The examples of China and Vietnam show this. And the United States holds the key to both. This is why Kim is dangling the denuclearization carrot in front of U.S. President Donald Trump. The question is whether Pyongyang is sincere about denuclearization. From its perspective, the ideal scenario would be to keep part of its nuclear deterrent while sanctions are slowly removed and investment flows into the country increase. Ultimately, North Korea would like to be a new India or Pakistan. South Korea is, of course, also central to peace on the Korean Peninsula. President Moon Jae-in has been the main catalyst behind the negotiation process unfolding over the past few months. The tangible benefits of a peace declaration or treaty for the Korean Peninsula go beyond inter-Korean reconciliation. Supporting North Korea’s economic development would help bring a broader peace regime to the Korean Peninsula, one in which Pyongyang could decide that economic integration with South Korea makes its nuclear deterrent redundant. In the mold of previous liberal leaders, Moon sees talks and economic exchanges as the best way to achieve this outcome. Indeed, there is a question as to whether Seoul is willing to abandon its peace agenda even if it comes at the expense of relations with the Trump administration. The United States is the third key vortex in Korean Peninsula peace negotiations. Washington’s top priority is clear: final, fully verified denuclearization, as the Trump administration puts it. But the road toward this goal would be long, so Washington also seeks short-term gains. Most clearly, the United States has openly linked the North Korean nuclear issue to relations with China, including the ongoing trade war between Washington and Beijing. Furthermore, the United States does not want to break the alliance with South Korea even if its relationship with North Korea improves. Trump might have sent mixed messages regarding the presence of U.S. troops in South Korea, but so far there has been no real indication that the alliance per se is at stake. Considering this range of interests, it is unclear whether Washington is willing to offer Pyongyang real incentives to achieve full denuclearization. As the diplomatic process continues to unfold on the Korean Peninsula, peace seems within reach. Seoul and Washington insist that Kim is committed to full denuclearization. A security guarantee from the United States, also underpinned by China, could well lead to full denuclearization. Economic support from the key actors in Korean Peninsula affairs, plus others such as Japan, the IMF, or the EU, could seal the deal. Having said that, the current process could just as likely end in a total breakdown of relations between the United States and the two Koreas. The Trump administration might reach the conclusion that full denuclearization is not on the table and react accordingly. Maximum pressure would thus become its policy of choice to deal with North Korea again. But Seoul, not to mention Beijing, is unlikely to support this scenario. Open disagreement between the United States and South Korea would be a real possibility and significantly damage the bilateral alliance. From our perspective, peace would be the ideal scenario. And the way to do this – it seems – is for the United States to offer North Korea economic incentives and regime security in exchange for nuclear disarmament. A more prosperous, denuclearized North Korea would defuse one of the main security hotspots in Northeast Asia. It would also put an end to the last remnants of the Cold War in the Korean Peninsula. We have to be realistic and it might well be that the Koreas and the United States will just muddle along in incremental steps, with disarmament being reciprocated with sanctions relief, economic aid, and ultimately a peace regime. With Kim, Moon, and Trump committed to diplomacy in the Korean Peninsula, however, we should also hope that peace could be achieved. Tat Yan Kong is Reader in Comparative Politics and Political Economy at SOAS. Ramon Pacheco Pardo is KF-VUB Korea Chair at the Institute for European Studies of Vrije Universiteit Brussel. The United States must commit to diplomacy with North Korea -- even in the face of setbacks. South Korea’s Strategy to Bring Peace to the Peninsula: Credit TrumpWhy US-North Korea Talks Will FailDate Set for the Next Step in Dialogue Between North and South KoreaNext High-Level Talks Set for North and South KoreaHow Much Do the Panmunjom Agreements Matter?